A wealth of privately-run organizations are springing up to provide a pricier alternative to established state-run societies that train children in activities ranging from classes in figure skating and ice hockey to art clubs and dance groups. The Russian state system of supplementary education for children is comprehensive, its foundations already laid in Soviet times. Today the choice of hobbies to suit everyone is even greater, thanks to the mushrooming of privately run clubs and societies, meaning that parents are now spoilt for choice when it comes to finding activities to broaden their children’s horizons. 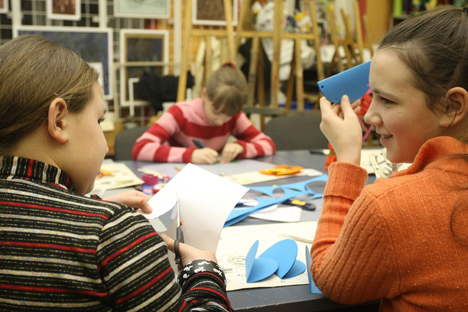 The Soviet period left Russia with a network of children’s arts centers, formerly known as Pioneer centers. This is a state-funded organization, and there are usually centers in every district of every Russian town. Here cultural activities, sports, ecological activities and civic patriotism clubs take place under one roof. Children can engage in singing, drawing, dancing, music, environmental and nature studies, history, sewing, knitting, making things or playing chess. All over the country, there are also dozens of state-run music and art schools and sports clubs. The activities themselves are either free or available for a minimal monthly charge (200-500 rubles ($6-14), but you do have to buy the required materials - paints, brushes and paper for art classes, for instance. However, not every child can find what they want at the nearest arts center – the choice offered is different in different places – and not all parents are able to drive their child to another part of town. Moreover, the quality of teaching at the centers is not always the best because of the low pay which the teachers receive. For these reasons, better-off parents often choose to send their child to a private provider. That allows them to make a more discriminating choice of teacher and choose a convenient location, but they have to pay for the lessons. Olga’s son is five years old and he has already been going to figure skating classes for six months. “My neighbor was sending her son to skating lessons and so I sent mine along too for company. At least someone in the family will be able to skate well,” she says. Classes take place three times a week, including two lessons on skates, one general fitness class in a sports hall and one choreography class. The cost of these lessons is 6,000 rubles a month (about $170) plus sports kit and skates. This is approximately the sum you have to spend on your child if they want to learn to sail. Yachting coach Irakly explains that training an athlete in any sport costs parents a small fortune, because they not only have to pay for regular sessions and sports gear, but also trips to competitions. “Little sportsmen can’t develop without a decent competitive environment; trainers and parents need to spend a lot of money,” he says. Of course, not all parents take a systematic approach to this type of training. Often the main thing isn’t to develop a particular skill or talent in a child but simply to occupy them with something or other. “I often get kids who by 11 or 12 years old have already done a bit of swimming, soccer, athletics, hockey and diving,” says Irakly. Taking hockey lessons costs an average of 3,500-5,000 rubles per month ($100-140), with training twice a week. Outside the capital, prices are usually lower but won’t be less than 1,500-2,000 rubles per month (about $50). You can send your child to ballroom dancing classes for 2,000-4,000 rubles a month ($60-120) but you must remember that this hobby requires parents to buy expensive costumes for performances, with outfits costing anything from $200. Individual drawing and painting lessons cost 500 rubles an hour ($14), and group lessons 2,000 to 5,000 rubles a month ($40-130) depending on the level of teaching. Musical instruments are slightly cheaper at 300 rubles ($90). The Russian Ministry of Education and Science is now convinced that the supplementary education system set up in the Soviet era is in need of modernization, but that whatever changes are made, it must still be free. “The most important achievement of our education system is its free supplementary education,” said the Minister of Education, Dmitry Livanov. “We are one of the few countries in the world where there is free supplementary education for every citizen. We plan not only to maintain the full extent of these social guarantees, but to extend them. “Traditionally there was a strong system of supplementary education in the USSR, but over the last 20 years, facilities have considerably diminished. It is essential that we move to a new level in developing the system of supplementary training and education for children in our country,” said Livanov. By June 2014 the new development plans for supplementary education should be fully worked out. The Ministry’s plans include creating clubs for studying innovation and nanotechnology and developing educational tourism. Children’s education is to be supplemented not only through cultural and sporting organizations (such as museums, art studios and sports clubs) but also through representatives of science and business. The Ministry also intends to give educational institutions the opportunity to offer jobs to specialists who are not trained teachers, in particular technical specialists or actors.